The Headquarters which was established at the Dalmore Distillery. 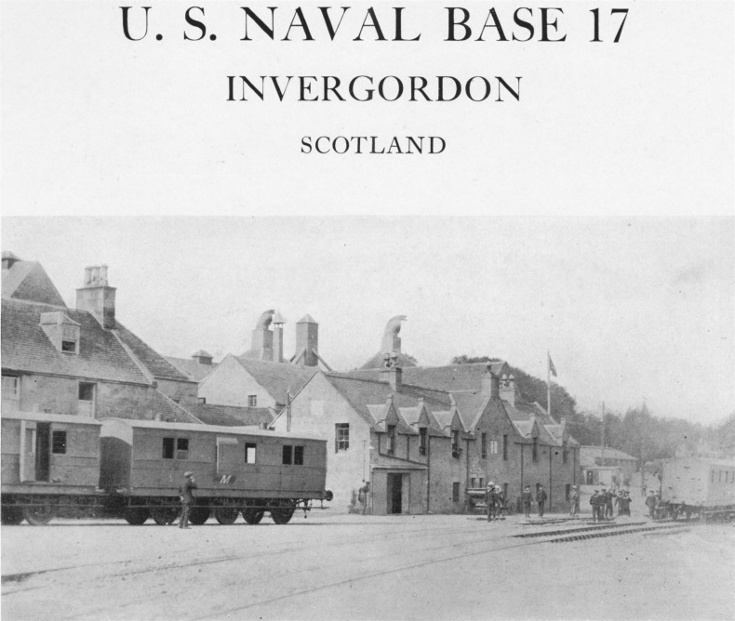 Re the reported railway link linking Dalmore to Invergordon harbour during WW1 - does anyone know if this was actually constructed? Im aware of the sidings at Dalmore as spur from Alness station and of course the Invergordon dockyard lines but have always wondered was there a line other than the "main" line ever? (I was told many years ago that this was so and that it may have been narrow guage). At Rosskeen Bridge there were in the 1960's some remains between the railway bridge and the road bridge of some pillars/columns that could have supported a rail bridge they could be seen at low tide and may still be there. According to the Invergordon Museum, the line existed and it followed along where the present road is. They also say that it was a specially constructed railway. The railway line from Dalmore ran between the road and the sea and carried specially adapted carriages to Invergordon harbour. They carried mines which the US Navy laid underwater on the Northern Barrage in 1918. The road was closed when this train ran to Invergordon. Spur line from main line ran down behind Belleport house taking mine components from the States to Kyle and then by rail to US Base 17 Dalmore, Invergordon. Interesting, too bad their is no photographic record of the railway. The area from the donkey bridge to Seaview always looked different to me, also the what looked like granite rocks along the shore-line there. This railway is also mentioned in the Inverness History forum, which states in part.. So it was that the distilleries at Dalmore (Alness and very convenient to Invergordon (Base 17) Indeed an extra railway line from Dalmore to Invergordon harbour, was built along the shore road, to keep the main line clear of mine traffic..